There is troubleshooting guide for Dreambox satellite deocder for card sharing and if you wonder how you can perform the same for Openbox/Skybox or Yumy S9 HD satellite decoder, here are some simple steps that you can follow to get it done. First, make sure that you have the necessary dish with correct positioning setup and LAN cable plugged into decoder for internet connectivity. For the dish positioning accuracy, go to Menu -> Installation -> Antenna Setup and look for satellite signal intensity for respective satellite selection. A good signal intensity should be closed to 80% (the higher the better). By now, you should be able to receive FTA (Free-to-Air) channels even without a valid card sharing account activated and internet connectivity. 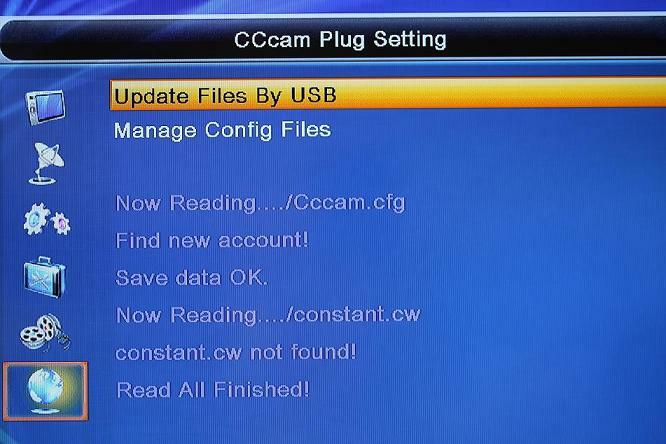 Then, load in the CCcam.cfg file either following thumb drive or remote control method. On the network side, apply DHCP so that you will get automatic IP assigned rather than static IP by going to Menu -> Network Setup, then toggle DHCP to ‘On’ follow by Apply button press. Browse to Menu -> Network Setup -> CCcam Client Setup -> Manage Config Files -> 1. CCcam.cfg and check if the cline account is active (must show online rather than login or offline). Otherwise, press green button to activate it with check sign. If it doesn’t work, restart both ADSL model and Openbox/Skybox or Yumy S9 HD satellite decoder and repeat step v. to check for online status. Hopefully this will able to help you troubleshoot and setup Openbox/Skybox or Yumy S9 HD satellite decoder with card sharing account by yourself.